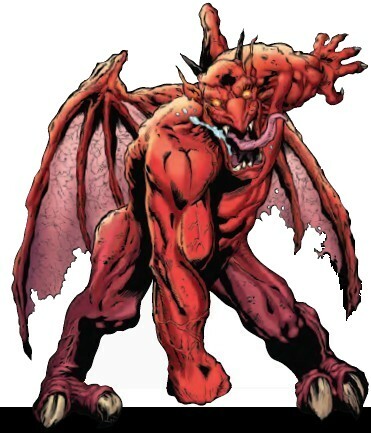 Powers/Abilities: Y Ddraig Goch possesses superhuman strength (lifting 50 tons). He can shift between dragon and human form by will though his transformation into his dragon form drains energy from others within an area of roughly 50 square miles, rendering them unconscious. He can breathe fire in both forms. As dragon he has large, leathery wings for flight. (Historical) - Y Ddraig Goch, the Red Dragon, was the noble and selfless defender of all Britons. (Wisdom#3 (fb)/Mabinogion) - <Ca.73 BC> Ddraig Goch fought the invaders' White Dragon so hard cattle lost their milk and women miscarried. King Ludd eventually trapped the fighting dragons in a pit full of mead in Dinas Emrys in Snowdonia. (Wisdom#3 (fb)/Historia Brittonum) - <Ca. 5th century> When King Vortigen tried to build a castle at Dinas Emrys the foundations were demolished each night. Told by his advisors to sacrifice a boy with no natural father to end these problems Vortigen found the young Merlyn, who fit the description. Rather than be sacrificed though Merlyn freed the dragons from imprisonment and he and Vortigen witnessed Ddraig Goch finally defeat the White Dragon, now representing the Saxon invaders. (Thor: Heaven & Earth#4 (fb) - BTS) - Ddraig Goch came to live in a cave in the mountains above Mawddach Valley in Wales. (Thor: Heaven & Earth#4 (fb) ) - <Ca. 9th century> When Prince Rhodri of Gwynedd (see comments) stole a married Viking woman and took her to Wales, the Vikings soon arrived on the Welsh shore to retrieve her. As the locals battled them many died on both sides. Eventually the men of Gwynedd returned to the mountains, but the Vikings continued on to search for the stolen woman inland. Feading their arrival the men of Dolgellau pleaded with Ddraig Goch to help them against the Vikings and delivered women to him as payment (one half before the job, one half after the job was done). Though Ddraig Goch didn't care much for the Welsh's problems because their prince had brought them upon them he agreed to help them due to the offering. (Thor: Heaven & Earth#4 (fb) - BTS) - The women of Dolgellau were brave and accepted their fate. The dragon consumed one half of them as was the deal. (Thor: Heaven & Earth#4 (fb) ) - After the meal Ddraig Goch flew against the invading Vikings and slaughtered them. One of them managed to pray for the Aesir's help before he died. Though they came too late to save him the Aesir were not too late to face Ddraig Goch, who asked them to leave while insulting the Aesir as upstarts and Odin as their nursemaid. Ddraig Goch pierced Odin's shield then went for Thor, who was tackled out of the way by Vidar. Agnar the Fierce arrogantly offered Ddraig Goch the first hit and was pummeled into unconsciousness. When Ddraig Goch flew towards Odin, Thor and Hermod again Thor threw Mjolnir at the dragon, who kept it between his teeth and used Mjolnir's enchantement to always return to Thor, as a way to come down at Thor even faster. 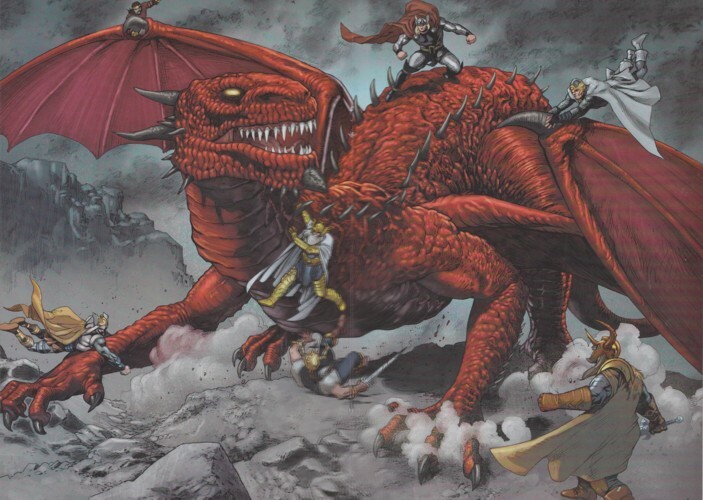 But Ddraig Goch couldn't hold Thor down for long and after Thor threw the dragon over his shoulder Odin knocked him to the ground with a punch to the jaw. Angered further by these attacks Ddraig Goch kept fighting the Aesir, whose combined efforts were not enough to fell the dragon. Ddraig Goch went to the sky again with Thor on his back. When all attempts to get him off his back Ddraig Goch grew weary and fell from the sky. Thor readied to slay the dragon, but Odin ordered to let the dragon live because it fought honorably and was only defending his land. Odin bargained with Ddraig Goch, who agreed to persuade Rhodri to return the stolen Viking woman and to stop the blood sacrifices. (Thor: Heaven & Earth#4 - BTS) - Ddraig Goch devoured Rhodri, who tasted even better than the women of Dolgellau. (Wisdom#3 (fb) - BTS) - The following centuries Ddraig Goch aided the Welsh, descendants of the Britons, on numerous occassions. (Wisdom#3 (fb)) - <1879> Ddraig Goch fought at the battle of Rorke's Drift, aiding 150 British soldiers in defending a supply station from 4000 Zulu warriors. (Wisdom#3 (fb) - BTS) - Ddraig Goch participated in many other significant Welsh conflicts. (Wisdom#3 (fb)) - Haunted by the endless killings Ddraig Goch began drinking heavily at pubs and gradually forgot his true identity. 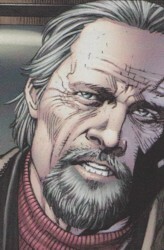 As Dave Griffin he violently took control over Cardiff's underworld including drug trafficking, prostitution and protection rackets. He became addicted to his own drugs and killed mercilessly. (Wisdom#3 (fb) - BTS) - Griffin's actions caught the attention of MI13. Through photos and the insights of their mystics they found out who Griffin actually was and that his mind was affected by his drug abuse. (Wisdom#3) - Pete Wisdom confronted Griffin at the Red Dragon pub in Cardiff, mocking the Welsh and Griffin until Griffin decided to fight Wisdom. Pulling out an ancient parchment Wisdom challenged Griffin to a Ancient Rite of Dragon Duel and nominated Shang-Chi to fight on his behalf. Dai Thomas and Wisdom talked outside the pub about how far the symbol of the Welsh Nation, which to Thomas' surprise was actually real, had fallen. Wisdom then split up his team to two observation posts (Maureen came with him while Tink, Captain Midlands and John were at the other post). Inside the pub Griffin ordered his men to take out Shang-Chi, but he easily avoided all their attacks and knocked them out, even avoiding bullets. When all his men were down Griffin took on Shang-Chi himself and after a kick to the face spit fire, which Shang-Chi marked as progress because Griffin started remembering his true personality. Taking energy from every person in the city Griffin ripped through his human skin to transform back into his dragon form (though far smaller than in the past...he grew larger again). Having finally broken through to him Shang-Chi explained to Ddraig Goch that he was actually a noble creature and though Shang-Chi kept trying to show the dragon his history the dragon gave him an uppercut that sent Shang-Chi flying far into the sky. When Shang-Chi's ascent ended and he began to drop back down to the city Ddraig Goch caught him in mid-air and protected Shang-Chi from the impact when they crashed through the ceiling of Wisdom and Maureen's obvservation post. Transforming back to human form Ddraig Goch was glad that Shang-Chi was still alive. Wisdom then broke his promise to Shang-Chi that the Welsh Dragon would go free. Y Ddraig Goch cussed at Dai Thomas and Pete Wisdom while MI13 operatives put him into a truck with power-dampening shackles on him. (Thor: Heaven & Earth#4 - BTS) - Ddraig Goch somehow escaped custody. (Thor: Heaven & Earth#4) - Posing as an old man Ddraig Goch told an author about his fight with the Aesir during a trainride through Midwest Wales. When Ddraig Goch got off the train he told the author as a parting comment that Rhodri had tasted better than the women. Ddraig Goch then transformed unseen by others into his dragon form and flew away. The author saw the dragon in the sky. Comments: Adapted by Paul Cornell (writer), Manuel Garcia (pencils) & Mark Farmer (inks). Lud is the legendary founder of London and his story and involvement with Ddraig Goch can be read about in the Mabinogion. The full story of Vortigen and Merlyn can be read about in Historia Brittonum. Rhodri the Great (ca. 820-878) was a Welsh regent. He became king of Gwynedd in 844 after his father's death. In the Marvel Universe it seems like he never became king. He was called a prince by Ddraig Goch in story, which would set the story before him becoming king and by the end of the story Rhodri was dead. Either Ddraig Goch waited until the end of Rhodri's life to eat him or Rhodri died before he ever became the king of Gwynedd in the MCU. The battle of Rorke's Drift occurred during the Anglo-Zulu War in 1879 in the British colony of Natal (now the South African province KwaZulu-Natal).